One might inadvertently think, that the Pyrenees are just a place for nature-lovers and sport activities enthusiasts. Notwithstanding the fact that Pyrénées inhabitants, from the Basque country to the Catalan Coast are real hedonists/food lovers. With many local specialties such as Gâteau à la broche, Garbure, Espelette chilli pepper, Noir de Bigorre dark Pig, Limoux wine, a huge variety of cheese, and high quality wines, there are many other reasons to come and discover the Pyrenees. For the one who hasn’t tasted a hearty Bearnese Garbure soup, upon returning from a day on the ski slopes or a hiking tour, is definitely ignorant of the well-known French way of life consisting of always combining effort with comfort. 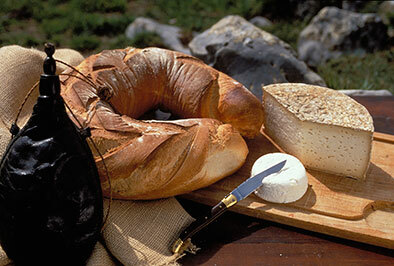 When it comes to gastronomy, each Pyrenees’s area possesses its own treasure. As a starter, let’s choose a Bearnese Garbure soup or Azinat, a soup from the Ariege with cabbages and various sausages which, as well as Garbure soup, can also be eaten as a main course. Then let’s enjoy some delicious delicatessen, like the famous Bayonne ham or some fattened ducks meat from the Hautes-Pyrenees. When the meat course comes along, you’ll be spoilt for choice, from Gascony beef to Barèges Gavarnie lamb, and of course, the famous dark pig, from Gascony or Basque country. As for vegetables, do try white beans from Tarbes, onions from Trébons and of course ceps, girolles and others mushrooms that grow all over the place for you to pick, but do not tell, mum’s the word ! When it comes to cheese, go for the tasteful Ossau-Iraty sheep’s milk cheese, the cow’s milk cheese Tomme des Pyrénées, the Ariège’s Bethmale made of unpasteurized cow’s milk or some little jewels of goat’s milk cheeses. Then enjoy the ultimate sweet taste of either a Gateau à la Broche or a delightful “Russe”, a praline cream filled cake from Artigarrède to Oloron. Wash all of this down with some Irouléguy, Jurançon, Corbières, Fitou, or a Roussillon wine, not forgetting, for your finishing touch, the sparkling Blanquette of Limoux.